This is to notify all staff members that there is going to be a general meeting next week on Monday, 27th April. The meeting will be presided over by the Senior Branch Manager, Mr. XYZ. Attendance is compulsory for all employees. The main issue to be discussed in the meeting revolves around how to improve the overall performance of our branch. Every employee is encouraged to provide practical suggestions. It is, therefore, advised that staff members come prepared to the meeting to present their ideas. 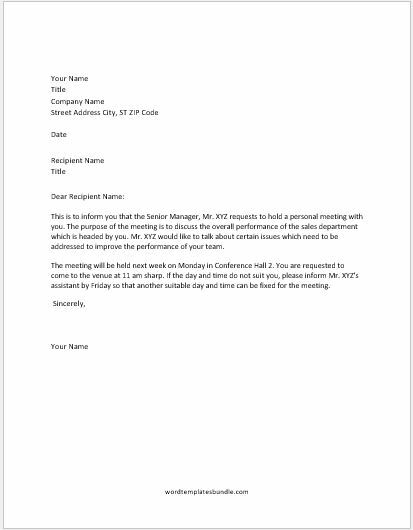 This is to inform you that the Senior Manager, Mr. XYZ requests to hold a personal meeting with you. The purpose of the meeting is to discuss the overall performance of the sales department which is headed by you. Mr. XYZ would like to talk about certain issues which need to be addressed to improve the performance of your team. The meeting will be held next week on Monday in Conference Hall 2. You are requested to come to the venue at 11 am sharp. If the day and time do not suit you, please inform Mr. XYZ’s assistant by Friday so that another suitable day and time can be fixed for the meeting. This is to notify all employees that the monthly official meeting will be held on Thursday, 29th June at 4 pm in the main conference room. 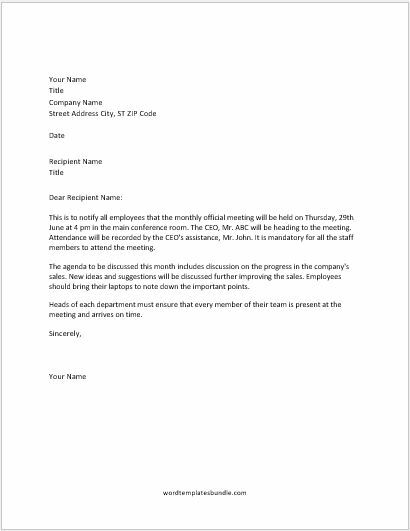 The CEO, Mr. ABC will be heading to the meeting. Attendance will be recorded by the CEO’s assistance, Mr. John. It is mandatory for all the staff members to attend the meeting. The agenda to be discussed this month includes discussion on the progress in the company’s sales. New ideas and suggestions will be discussed further improving the sales. Employees should bring their laptops to note down the important points. Heads of each department must ensure that every member of their team is present at the meeting and arrives on time. 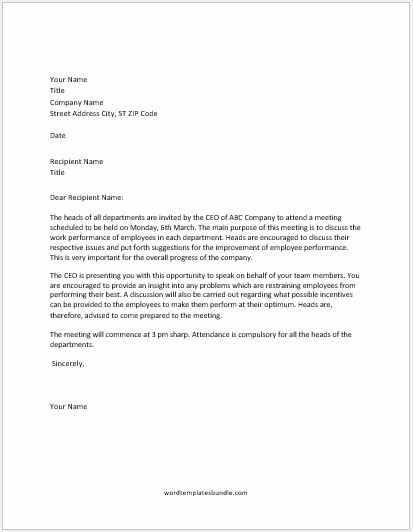 The heads of all departments are invited by the CEO of ABC Company to attend a meeting scheduled to be held on Monday, 6th March. The main purpose of this meeting is to discuss the work performance of employees in each department. Heads are encouraged to discuss their respective issues and put forth suggestions for the improvement of employee performance. This is very important for the overall progress of the company. The CEO is presenting you with this opportunity to speak on behalf of your team members. You are encouraged to provide an insight into any problems which are restraining employees from performing their best. A discussion will also be carried out regarding what possible incentives can be provided to the employees to make them perform at their optimum. Heads are, therefore, advised to come prepared to the meeting. The meeting will commence at 3 pm sharp. Attendance is compulsory for all the heads of the departments.